You simply cannot have missed the mass resurgence of classic rock over the last few years. 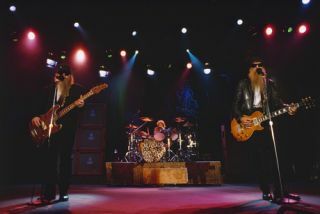 Whether it be the triumphant return of old timers from the '80s (even some of those that we're perhaps best left as a distant spandex-covered memory) or the crop of new bands eager to name check their poodle-permed heroes, one thing is for sure - classic rock is bigger than ever, making 2010 the perfect time for Rhythm's sister title Classic Rock to launch their own festival. And that's exactly what they've done. Come inside to see what we made of day one of this retro feast. The Union (featuring members of defunct rockers Thunder, Led Zep revivalists Big Linda and hotly-tipped-yet-never-quite-made-it six stringers Winterville and more) get the classic rock proceedings off to a most definitely classic start with their blend of hard rock anthems and heartfelt ballads acting as a fine launchpad for the day to come. Drummer Geoff Holroyde (who first caught our attention as the wild-haired and even wilder-eyed sticksman for Big Linda a few years back) is rock solid, just what's needed for the aural assault launched from the axes of mainmen Luke Morley and Pete Shoulder. How do you follow that up? With more classic rock, of course. The Answer have pretty much played exactly the same show for the last two years solid, but when it's a show as good as this there's little room for complaint. Northern Ireland's finest are even tighter than frontman Comac Neeson's skin-hugging shirt. Which is pretty darn tight. Next up it's a dash to the press area where we catch up with Black Label Society's Will Hunt, the results of which you'll be able to read on this very website soon, so keep your eyes peeled for that. After catching up with the ridiculously busy Hunt, we check out the tail end of the very stern looking - but nonetheless awesome sounding - Gary Moore, before taking in the jaw-dropping spectacle that is Heaven and Hell's tribute to Ronnie James Dio. Glenn Hughes and Jorn Lande help Vinny Appice and co through a wealth of Dio-era Sabbath tracks in what proves to be a pulsating, although heartfelt, tribute, all of which is underpinned by Vinny's monstrous DW set-up. Talking of monstrous kit work, a rejuvenated Black Label Society take the Metal Hammer stage by the scruff of the neck while bludgeoning them with pounding snare and bass courtesy of drummer Will Hunt. Hunt is on fire (almost literally thanks to a ton of pyro exploding around him) throughout a relentless 60-minute set. Closer 'Stillborn' showcases a band in full flight and at the peak of their powers in what is billed as their final UK show of the year. Let's hope appearances this side of the pond are less sporadic in 2011. While all this is going on Mike Portnoy is providing a prog drumming masterclass with Transatlantic in what can only be described as an epic performance.